Copy of the letter sent this week to Missoula County Commissioners. 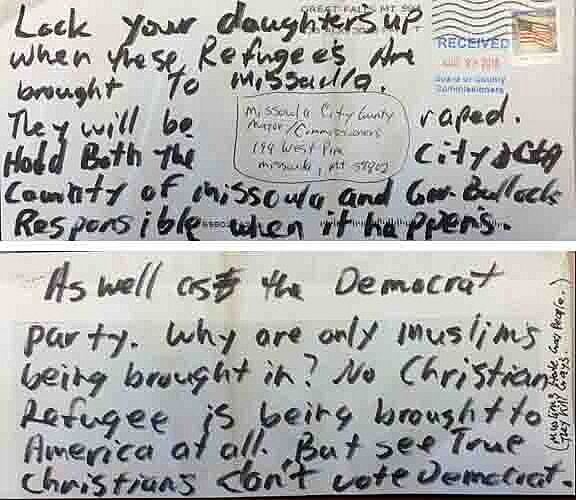 Missoula’s efforts to resettle refugees fleeing violence and war continues to attract anonymous, hateful mail, the latest arriving this week in a series of letters sent to businesses and Missoula County commissioners. It was back in April when the Missoula County Sheriff’s Department opened an investigation into a forged letter suggesting that county commissioners no longer supported the reopening of a refugee resettlement office in Missoula. That letter included a Great Falls postmark and the forged signatures of all three commissioners. It was addressed to the U.S. Department of State and the Bureau of Population, Refugees and Migration. This week, commissioners received a second letter bearing a Great Falls postmark. It included no return address and a handwritten message printed in black marker. 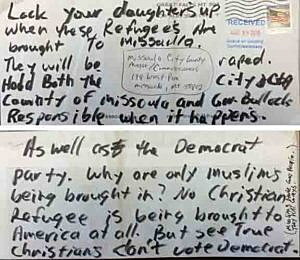 The back side of the letter went on to suggest that no Christian refugees were being brought to Missoula, but only Muslims. It said “true Christians” don’t vote Democrat. Commissioners called the letter both unfortunate and misleading. The other letter, received this week by at least one Missoula business, was allegedly from “Keep Citizens Safe.” The Montana Human Right’s Network couldn’t be immediately reached Thursday to verify the group’s existence or location. 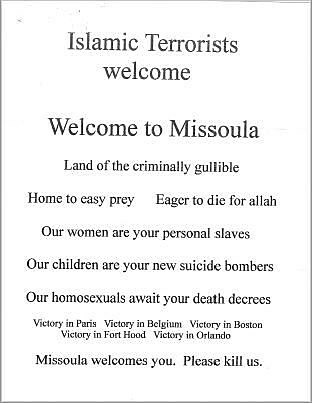 Copy of letter sent this week to a Missoula business. Mary Poole, co-founder of Soft Landing Missoula, said the letters don’t represent reality, nor do they reflect the opinion of Missoula residents. Last week, the Missoula City Council approved a resolution supporting the national Welcoming Cities campaign. More than 50 U.S. cities have joined the campaign to become a “welcoming city” for refugees since the White House Task Force on New Americans was founded last September. Soft Landing began working with the International Rescue Committee at that time to reopen Missoula to international refugees. Over the next year, the IRC is expected to resettle roughly 100 refugee families in Missoula. “We have the opportunity to help people who are themselves victims, not perpetrators of terrorism,” Poole said.